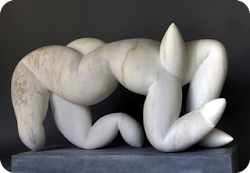 William Peers landscape sculptures are primarily in marble sourced from all over Europe. This sculpture undulates gently. It stands off the ground on stainless pins. Although large the skin is thin and the contours of one side are exactly mirrored on the other side. I am delighted to have a sculpture that does not need a base, and can stand alone in the landscape.